Your gently used clothes, home goods and furniture can help survivors and benefit the Julian Center. Thrifty Threads is a thrift store and donation center owned and operated by the Julian Center. When someone makes a decision to leave an abusive relationship they don’t always have a lot of time to plan, or pack. That means they leave most of their personal belongings behind. When they arrive at our shelter doors the clothes they have on may be everything they have in the world. 91 percent of our clients live at, or below, the federal poverty threshold so replacing items isn’t possible. That’s where Thrifty Threads comes in. We accept donations of gently used clothing for men, women and children along with household goods including linens, furniture, books, toys, and small appliances. 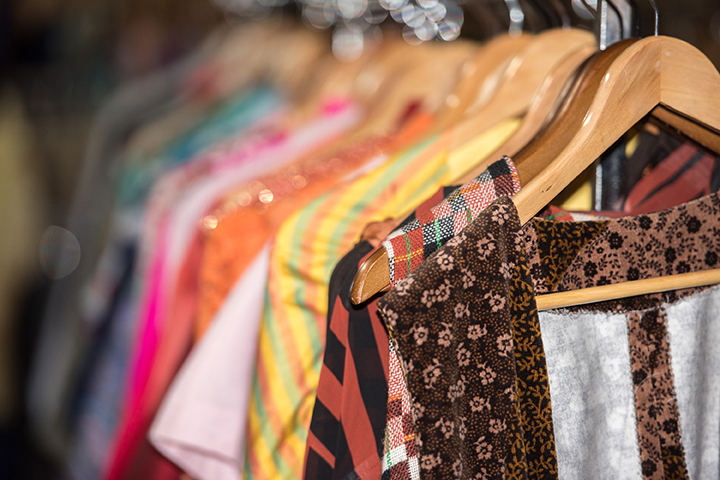 Our clients shop at Thrifty Threads free-of-charge for items needed to recover and to establish new beginnings. In some cases that might be clothing, furniture, or shoes and toys for their children. Excess items are sold to the public where proceeds help underwrite our victim programs and services. Your in-kind donations allow our clients to start over and to live a life free of abuse. We’re a proud partner with National Council of Jewish Women. While we appreciate the offer of all donations there are certain things we can and cannot take at the donation center and at the shelter. Below is a list of items. THANK YOU! No automotive waste: batteries, antifreeze, tires, oil, additives, parts, etc. No computer equipment: hard drive-tower, keyboard, mouse, monitor etc. You may request a free pick-up of furniture you wish to donate. To schedule a pick-up please contact us at 317.802.9612 at least two weeks in advance.